As a group, women have neither followed the March Hare to the Tea Party nor signed up for Wendy Davis’ trip to Wonderland, leaving the campaigns to ponder their place on the electoral chessboard. With state Sen. Leticia Van de Putte, D-San Antonio, now all but officially running for lieutenant governor, the top of the two parties’ respective tickets look a lot like a middle school dance — the boys at one end of the gym and the girls at the other. The context of gubernatorial candidate and state Sen. Wendy Davis’ rise amid the politics of abortion and the girl-boy sorting of the two tickets means that both sides will be keeping an even closer eye than usual on the female electorate. Results from the October 2013 University of Texas/Texas Tribune Poll suggest specific challenges for both campaigns in their hopes of attracting female voters. Women’s lukewarm views of extreme conservatism reveal some risk in Abbott’s early embrace of the Tea Party, but also the potential rewards of his recent attempts to brand himself as “a new kind of Republican candidate” (aside, of course, from setting up the inevitable attack on Davis on allegations of ethical shortcomings). The potential risk emanates from the necessities of competing in a GOP primary in a state where 39 percent of women identify as moderates — 11 points more than Texas men. When combined with those identifying as liberals, 60 percent of the female electorate consider themselves non-conservatives. In addition to the sense that the Tea Party has been playing a pivotal role in the Texas GOP, a Democratic slate headed by Davis and Van de Putte can be expected to attempt to drive Abbott and others to publicly affirm their Tea Party ties even as Abbott eyes more centrist ground for a general election campaign. It makes sense for Democrats to soak Abbott in tea if they hope to attract crossover votes from women: Only 13 percent of women identify with the Tea Party compared with 25 percent of men; and while 33 percent of men think the Tea Party has too little influence, only 21 percent of women hold the same view. Traces of women’s relative aversion to the Tea Party also show up in attitudes toward U.S. Sen. Ted Cruz, the de facto figurehead of the Tea Party forces in Texas (and beyond). While Cruz’s net favorability (those having a favorable attitude of him minus those with an unfavorable one) among men is +6, among women it’s -4 (and as low as -17 among Hispanic women). So at the broadest levels, the electoral trends brewing in GOP primaries across the state could turn off women because many of them don’t see themselves as either part of the Tea Party movement or as conservatives. Thus, Abbott’s early appeal to the Tea Party electorate as the king- and queen-makers of Texas politics — one Cruz has only solidified — may prove beneficial to the Democrats. Yet these gaps between male and female attitudes toward the Tea Party do not a liberal female electorate make. For the most part, on a number of issues, the attitudes of the female electorate look a lot like the male electorate – that is, they look conservative. To take the most prominent example, on the Affordable Care Act, the GOP’s cause du jour, women are actually slightly more conservative than men. Views on Obamacare don’t appear to differ much by gender, with slight majorities of men and women opposing the health care law. But looking to the individual mandate, Texas women express more opposition than Texas men, 68 percent to 62 percent. As has been widely and repeatedly noted, the nature of Davis’ rise (and to a lesser extent Van de Putte’s) means that abortion will be an issue in the 2014 race — even if neither candidate brings it up themselves. Despite armchair assumptions, there isn’t a clear gender gap when it comes to abortion attitudes in Texas, but there are some interesting differences among women. While 40 percent of white women and 41 percent of black women support unfettered access to abortion as a matter of personal choice, that support drops to 32 percent among Hispanic women. Still, as a group, Hispanic women appear, at best, ambivalent toward the practice (reflecting in part the overall position of Hispanics somewhere between Democrats and Republicans on abortion). In presidential elections, women tend to be a Democratic group. Barack Obama won them by 11 points in 2012 and by 13 points in 2008. George W. Bush narrowed the gap to 3 points in 2004 after losing women to Al Gore by 10 points in 2000. 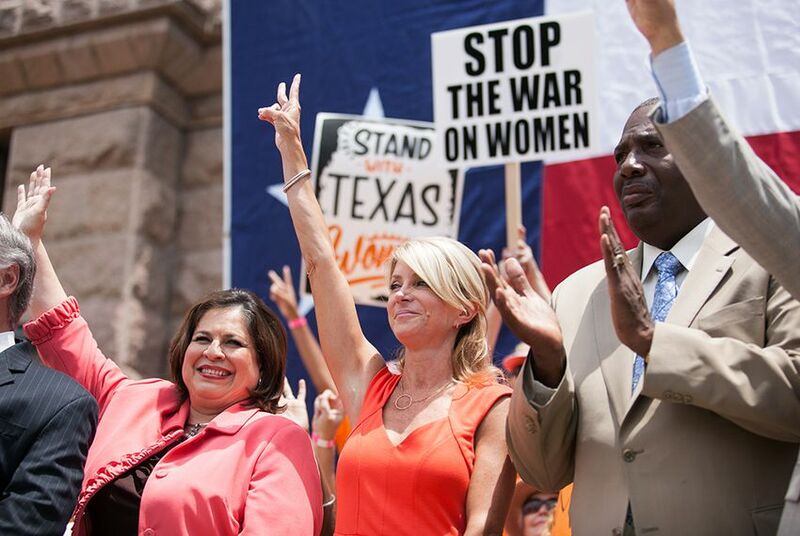 But this is Texas, and women are not, by and large, a fixed constituency of either party. Take, for example, the oft-discussed suburban woman. While we had previously noted the trend of suburban women turning away from the Republican Party, the most recent poll showed a resurgence in Republican identification among this group, jumping from 38 percent to 45 percent. (Democratic identification remained steady at 46 percent.) Looking at the rest of the October data, it appears that this resurgence is probably due more to national considerations (Obamacare, NSA spying, etc.) than to anything particular that has gone on at the state level. But the fluctuation in attitudes among suburban women illustrates the fluidity of attitudes among women writ large. As a group, women have neither followed the March Hare to the Tea Party nor signed up for Davis’ trip to Wonderland — leaving the campaigns to ponder their place on the electoral chessboard as the campaign takes shape.